It shines out of low segment. 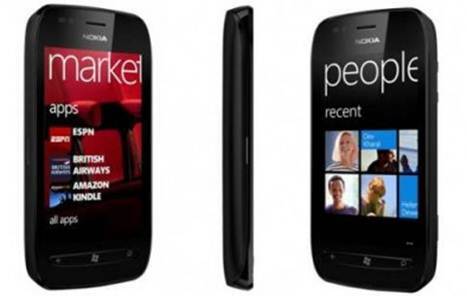 Nokia’s Lumia 610 intends to introduce Windows Phone OS to a number of users who concern about budget while seducing smartphone buyers away from Android by its nice design and reasonable price. Lumia 610 (119x62x12mm, 131.5g) owns eye-catching design showing off the quality. It includes removable rubber back lid and the rest is made of glossy-grey and black plastic. Following the luxury-theme are Lumia 610’s touch-sensitive buttons (back, home and search) right below the 3.7inch TFT capacitive touchscreen. This monitor owns 480x800pixel resolution of standard Windows Phone OS, as well as 252ppi density displaying pictures and texts, webs and videos in detail. Unfortunately, Nokia’s ClearBlack technology doesn’t appear, which means Lumia is less sensitive to lighting than other models in Lumia series, thus it is easily reflected. It’s an upside that Lumia 610 doesn’t lack performance thanks to Qualcomm MSM7227A chipset having ARM Cortex-A5 CPU (800MHz) and Andreno 200 GPU. Everything isn’t slow when running apps and navigating the OS which, in this case, is a Windows Phone 7.5’s simplified version (Mango). It allows Windows Phone 7.5 to operate on a device with 800MHz CPU and 256MB of RAM, a step backwards from Mango’s necessary requirement (1GHz processor and 512MB of RAM). However, this is the problem – only 256MB of RAM means that specific apps, such as Skype and Angry Birds, won’t work appropriately on this smartphone so they can’t be downloadable from Windows Phone Marketplace. Nokia’s Lumia 610 costs $384 and it competes directly with some power full Androids such as Huawei Honor U8860 ($419) and Samsung Galaxy Ace ($349). Otherwise, Windows Phone lovers can choose Nokia Lumia 710 (for $465) which give them full access to all apps in Windows Phone Marketplace and it is powered by single-core 1.4GHz Scorpion CPU. Overall, Lumia 610 is comprehensively good for those whose budget is under $407 because it provides another good option for people looking for something aside from Android stuff. HTC Desire C - Does It Have Anything Good?